How to choose a POWER COACH. What to look for. How to find a Coach. 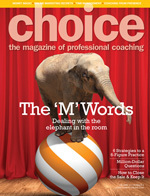 Home » Choose a Coach » What is Power Coaching®? Our Clients, our family, our coaches and our friends find that they are happier, healthier, more successful and more peaceful inside. They become more focused, disciplined, and incredibly productive people. Managers become more compassionate leaders capable of inspiring true greatness in themselves and others. At CLI we have mastered the art and science of coaching. We know how to transform thought. Science has proven that habits and behaviours will only change if there is a physiological shift in the brain. Years of R & D later, CLI understands how to turn potential energy into kinetic energy. PCMK tools assist the Client in accessing their innovative thinking centres. With ease they discover their own solutions to challenges and goals. It's a rewarding experience. Power Coaches don't have to specialize in executive coaching or team building or lifestyle coaching or finance coaching or whatever coaching. Using universal PCMK tools they coach anyone, anywhere on any challenge or goal. The process works because the coach's #1 job is to help you find your own answers to your challenges and goals. Of course, if required, they will mentor. This is a highly valuable service to our Clients. New positive belief systems are anchored to replace old patterns that don't serve us anymore. Bilateral thinking can be extremely difficult for most people. PCMK tools retrain the brain to think bilaterally thus creating more genius thinkers. And, we make it easy and fun! PCMK tools are designed to benefit and connect the body, mind and the spirit. For example, it could be our lack of self-confidence that is giving us an ulcer. PCMK tools combine our Intellectual Quotient and our Emotional Quotient to move us into whole-brain thinking. PCMK tools take from a couple minutes to one and a half hours to complete. Power Coaches have multiple levels of certification. Do you wish one-on-one Power Coaching� Group Power Coaching� Group Facilitation? Do you wish someone who has a Certified Power Coach� designation or more advanced training as a Professional Power Coach or Master Power Coach�? The support CLI provides their licensees is legendary. On-going R & D for new tools and continuous learning opportunities via distance learning for example guarantee that your Power Coach can continually pass valuable knowledge on to you.